Camilo Jose Vergara has a national and international reputation as an urban critic and photographer. More than any other single building, the Ransom Gllis home expresses Vergara's ideas about how urban Americans in general and Detroit residents, in particular, view their past. This home is something of a lynchpin for his reputation. Vergara has photographed this home dozens—perhaps hundreds—of times, and includes it frequently in the books of urban criticism that he publishes for his large audience. He uses this home to illustrate the acumen and creativity of Detroit's late Nineteenth Century architects; the tremendous prosperity of the city in the early manufacturing age, and the city's current neglect of its deep and extensive architectural heritage. Just as a field biologist might describe a species becoming extinct, or a linguist would describe the death of a seldom-spoken language, Vergara has documented the decline of the Gillis homes over the years. Vergara's most widely read book at these issues is The New American Ghetto (Rutgers, 1997). George Mason migrated to Detroit from Syracuse in 1870. Three years later, he completed his schooling and began working as a mechanical drawer. In 1875, he started collaborating with the architect, Henry T. Brush. Just one year later, he and Brush designed a magnificent home for Ransom Gillis, a successful dry goods merchant. Brush had no formal training as an architect but he and George Mason had read one of the most influential books of architectural criticism of their era, John Ruskin's Stones of Venice. Presumbaly, Ruskin's ideas about beauty influenced both architects as they designed this beautiful home. 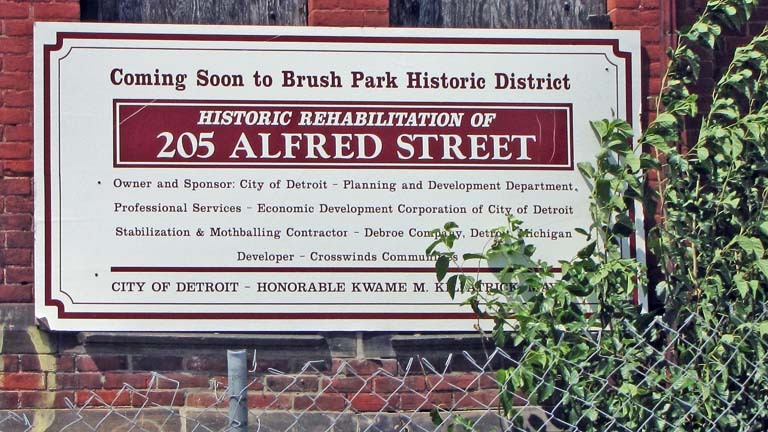 At this time, Brush Park was the most prestigious address in Detroit. In the ruins of this home, you may see the remains of an Italian-style tower and numerous broad arches above graceful windows. You could still see—at least in the summer of 2003—a trio of carefully designed round windows on the second story arch facing Alfred. Apparently, the original design for this mansion was greatly altered before it fell into decay. At some point in the distance past, a retail store was added to the front of the home. George Mason had a tremendous career as a Detroit architect designing, among other buildings, Trinity Episcopal at Trumbell and Martin Luther King; the Masonic Temple, First Presbyterian on Woodward and the Gem Theater. Mason gave Detroit one other important gift. He was the first to recognize the talents of a young draftsmen working for him in the early 1890s. Mason won the contract to design the magnificent Grand Hotel on Mackinac Island. He asked young draftsman on his staff to design an attractive porch so that patrons could relax and watch the steamers ply the lakes. That was Albert Kahn. Architect Brush died, unfortunately just three years after completing the Gillis home. This home was occupied by the Gillis family for just four years and then was sold to Mary and Charles Stinchman. He was a Detroit lumber merchant. In 1888, the home was sold to Alonson Fox, a very prosperous New York State lumberman who made a fortune with his timber lands in the Upper Peninsula. His firm, the Chicago Lumbering Company at one point owned much of Manistique, Michigan and built their own rail line to serve their property, the Manistique and Northweste rn. By the early 1910s, Alonson Fox moved out and the home was briefly occupied by Reverend Fikes of the nearby Woodward Avenue Baptist Church. He could not hold on to the property and, at the time of World War I, it was converted into a rooming house. Census 1920 recorded 35 occupants and the next census, 24. The home continued to be used as a rooming home into the 1960s while a small store was operated from the house at the corner of the Alfred and John R. The home, apparently, has been vacant since the late 1960s. Various efforts were made by Brush Park residents to improve their area and this home but they were not successful. When the Super Bowl came to Detroit in 2006, Mayor Killpatrick sought to tear down many unsightly old building near Ford Field. Those efforts led to rasing the historic Donavan Building where Barry Gordy briefly ran his Motown firm. However, there were objections to tearing down the Gillis home and several others in Brush Park. The city agreed to put up fencing and make a few repairs to these classic Gothic structures in hopes that they would be redeveloped later. By 2012, that had not occurred. Extensive information about the history of this home and its occupants is available in John Kossik's book cited below. Mr. Kossik's website—listed below—provide a tremendous amount of information about the history of this residence and its occupants. Jose Vergara believes that the progressively deteriorating Gillis Home expresses America's disdain for its history and architectural heritage. Is this fair or balanced? If Vergara had walked 250 feet west on Alfred toward Woodward, he would have seen two magnificently restored Victorian Era mansions: the Hudson-Evans Home at 79 Alfred and the Elisha Taylor Home at 59 Alfred. Which of these homes better represents the city's and nation's appreciation for its artistic wealth—the decaying Gillis Home or the restored Taylor and Hudson-Evans homes? In 2012, the Ransom Gillis home is still in decay but there are signs of new investments and renewal in the immediate Brush Park neighborhood. The prospects for the renovation of this home improved greatly in 2015. Many people have recognized its value and proposed doing something to preserve it. However, they were, I believe, detering by the very substantial costs and realistic concerns about the future of downtown Detroit. The HGTV cable television channel offer a program about restoring older homes entitled Rehab Addict hosted by Nicole Curtis. In the summer of 2015, she announced that the Ransom Gillis home would be restored as a project to be features on Rehab Addict. Importantly, Dan Gilbert and his Quicken Loans firm agreed to fund the rehabilitation. This is a very positive development for the Brush Park neighborhood. Apparently, the restoration will be supervised by Nicole Curtis and her crew, will be historically consistent with what the architects designed, will be featured on Rehab Addict and will be completed in Autumn, 2015. I hope that I will be able to post a picture of the restored home. 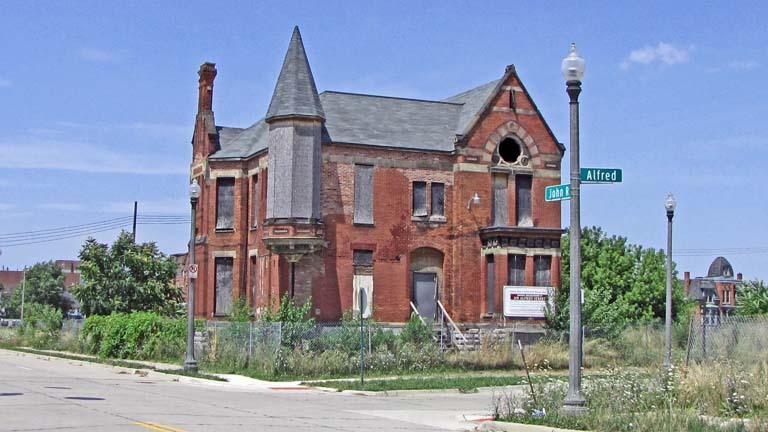 City of Detroit: Designated Historic District: Brush Park District. This historic district was established on January 23, 1980 and is bounded by Woodward, Mack, Beaubien and the Fisher Expressway.